Durres region is mainly famous for being the location of Durres City. One of Albania's oldest cities, the country's main sea port, the second largest industrial center after Tirana, Durres is on a small peninsula on the coast of the Adriatic sea. Durres City (pop: 114,000), the capital of the Durres district, is Albania's oldest city, is connected to the country's capital Tirana by a newly-built highway. The car trip to Tirana takes half an hour; or you can go by train. Durres was established in the year 627 B.C. by Korintha and Korkyra colonists. Old coins found in the area show how important it was during this period. In 229 B.C., Durres fell under Rome, and between the 1st to 3rd centuries A.D., it became the main port on the eastern coast of the Adriatic. Craftsmanship developed, roads, libraries, aqueducts and odeons were built, and the Durres amphitheatre, still visible today " the Balkans" largest Greek amphitheatre. In the 14th century, Durres was Albania's largest city, with around 25,000 inhabitants. In 1368, it became the centre of the Principality of Arb'ria. In 1508, the Ottoman Turks captured the city, and it was devastated. Most of the population fled, turning Durres into a village. It was redeveloped in the 17th century, once again becoming a trading centre and port. Durres was severely damaged by earthquakes, in 1372, 1905, and 1926. After World War II, Durres was transformed into an industrial city, and an important cultural and educational centre. The main fields of production in Durres today are mechanical engineering, chemicals, electronics, furniture, plastic, rubber, and food. Durres has the largest beach in Albania, that is also a popular summer and weekend getaway for Tirana. The lovely Durres Beach hosts hotels, holiday villas, restaurants, bars and nightclubs, as well as few other tourist facilities. Durres is also a good destination for yachting in the summer. Its population swells in summer, with 600,000 foreign tourists and Tirana residents. Memories of the dictatorship are kept alive by the concrete bunkers on the beach and coastline, every 100-150 metres, built to defend the country against foreign attack. 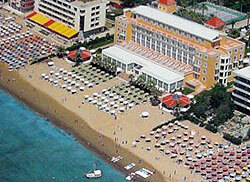 Mali Robit is a beach resort is about six miles from Durres. It has a spectacular backdrop of rugged mountain scenery but has made more concessions to tourism than most, with its beach being one of those long, straight, sun-bed and parasol types you find all over the Mediterranean. The major provider of accommodation is the Mali Robit resort hotel. This offers modern facilities, forty five apartments and five villas. There are other modern hotels at Golem beach, and plenty of other types of accommodation.